There are a lot of “Best ASVAB Study Guide” lists out there. Most of them aren’t all that great – so we’ve tried to create a better list. We’ve looked through most of the guides on the market today and we’ve written a brief summary for each of our favorite picks. Our goal is to showcase each guides’s strength and weakness. Because your ASVAB score is important, and as you’ll probably be spending a good amount of time studying, it’s critical that you get the right advice. So what makes this a better guide? Your ASVAB score helps predict future academic and occupational success in the military. And if you’re aiming for a top score chances are you’ll be spending a good amount of time studying. But what you study with is extremely important. Follow a weak study routine or practice with the wrong material and your score will suffer. That’s why it’s important to find the right ASVAB prep routine. Since you’re searching for the best ASVAB study guides, chances are you’re motivated to succeed. And that’s great. We firmly believe that a solid study guide partnered with consistent and dedicated preparation yields to strong scores. So why should you trust our opinion? We explain what makes each guide great, and what each book’s flaws are. Content is king here. For our reviews we look through each guides’s review material, practice question quality, and testing strategy effectiveness. We evaluate which study guides are best for training on specific sections of the ASVAB. Everyone is different and we all have our own weaknesses. Knowing who each book is designed for makes it easier to match to your own abilities and skill set. Keep in mind the ASVAB scores you in four critical areas: Arithmetic Reasoning, Word Knowledge, Paragraph Comprehension, and Mathematics Knowledge. Who is this guide for exactly? This guide is created first and foremost for students that are motivated to work towards getting a high score on the ASVAB. Working through these study guides will take time and effort. You’ll have to work through hundreds of practice questions before things begin to stick. Practice makes perfect, remember that. If you’re willing to put the man hour into studying then buying a prep book will be the easiest step in your ASVAB preparations. Just understand that if you’re not willing to put time into studying, your choice of book does not matter. Why and how is this guide divided? Best: these are books that everyone should use, regardless of skill level. They offer comprehensive review or have the highest quality practice questions available. Good: good all around books but not the best – these are solid options to use for supplementary practice. Also worthy of consideration if you can find them on the cheap. We’ve found that Kaplan does an excellent job in preparing test takers for the ASVAB and AFQT. And unlike other test prep companies, their study material is consistently tweaked and perfected for the right balance of review and practice. Kaplan’s put together a behemoth of a study guide. There’s content review for each of the subjects covered on the ASVAB; including Word Knowledge, Arithmetic Reasoning, General Science, Mechanical Comprehension and more. The material itself is written in a clear and easily understood language, making studying less draining. For practice, the package includes over 1,000 practice questions, 6 full length (3 in book, 3 online) ASVAB practice test all coupled with detailed answer explanations. We’ve found that the guide covers key math concepts very well and partners it with a strong array of practice questions – something other books haven’t done as well. We’ll add that this year’s edition includes access to online video tutorials and mobile ready tests and score reports making studying more accessible. Kaplan’s proved yet again why they’re a best seller in ASVAB Armed Forces test preparation. Good content review and solid practice partnered with accessible studying tools gives it our highest recommendation. Freshly released for 2016, ASVAB for Dummies is a great study guide for today’s test takers. It’s authored by Rod Powers, a retired Air Force first sergeant, and U.S. military guide writer for About.com. He has a knack for writing clean guides and fits well into the “Dummies” methodology. Like most “For Dummies…” prep books the material is comprehensive and easy to dive into. The content review is well written and covers all nine test subjects very well. There’s a health amount of information about the test, tips on how to approach the material, and strategies for tackling various problem types found within too. It’s a solid mix of things you need to know to score well. Included are six full length practice tests for the ASVAB and an additional AFQT focused test. We really like the included 300 flashcards that were included to help you improve on your vocabulary. It was a nice touch and something other companies don’t offer. We really like that the ASVAB For Dummies study guide is user friendly. A lot of other books, when opened tend to intimidate the reader into the horrors of the ASVAB and its importance. It’s our thought that quality prep books should ease your testing anxieties and gently expose you into the material, reinforcing it as you go. Powers has done a wonderful job at that, and his sporadic tips expose the genuine nature of the book. It’s highly recommend as a result. McGraw-Hill is an expert test prep publisher and their ASVAB study guide is good enough to also receive a recommendation from us. Author, Dr. Janet Wall was the manager at the ASVAB Career Exploration Program for the US Department of Defense and was a past Executive Director at ACT (American College Testing). To say she’s qualified to write a guide for the ASVAB would be an understatement. The study guide is comprehensive in its content coverage- making it arguably one of the best books for actual content refreshing. The review of the test subject is quite in -depth. As a side note, we noticed that the book does an excellent job at breaking down more complex math problems for easier understanding. And perhaps due to Janet’s past influence in the ACT exam, we also found that there was a focus on teaching prefixes, suffixes, and roots to get a better handle on the ASVAB verbal section, something other books missed out on. 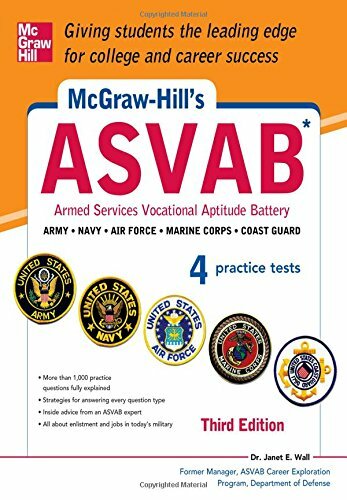 McGraw-Hill’s ASVAB includes 4 practice tests with explanations offered for every question. The question quality is very strong. We feel that in some cases, the 4 pre-tests contain questions are harder and more complicated than what you’d find on the actual ASVAB. And that’s a good thing. You’ll be better prepared and more likely to score very well on the exam as a result. We praise Janet Wall for producing such a quality prep book and give it our highly recommended mark too. Another one of our favorite ASVAB study guide comes from Exam Review Press Don’t let the publisher name’s deceive you though. This book is authored by a veteran and professional ASVAB, AFQT tutor. ASVAB Study Guide 2015-2016 takes a different route to prepare you for the exam. Instead of offering generalized practice exams, like you’d find in a Kaplan book, the focus here is on providing hundreds of individualized practice questions with explanations in a streamlined format. In reality, this makes the book a better choice for those crunching for the exam. It allows for a quicker study routine but with it comes a shortcoming – it’s a less comprehensive study preparation. And that may be fine for certain test takers. Those looking to boost their scores from the mid-40s to the 70s within a few days will find the guide useful. But if you’re looking to score in the higher ranges, you’d be wise to choose a more comprehensive offering. The adage, ‘practice makes perfect’ speaks volumes in these cases. We realize that not everyone needs to pick up a study guide book to prepare for the ASVAB. 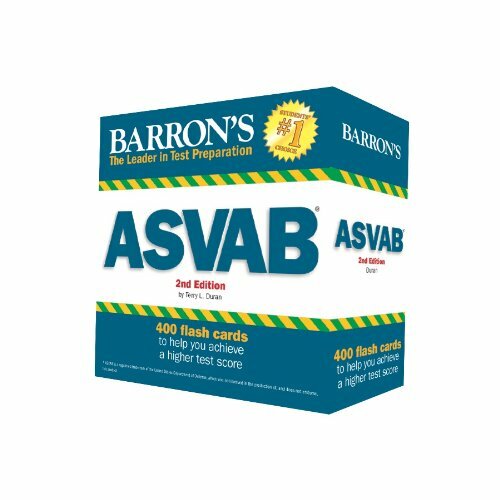 That’s why we’ve included Barron’s ASVAB Flash Cards, 2nd Edition into our list. This set of 450 flash cards features questions covering all nine ASVAB subsections, including word knowledge, paragraph comprehension, general science, electronics, shop and automotive information, mechanical comprehension, mathematics knowledge, and “mentally” assembling rotated objects. You’ll find most of flashcards to be multiple choice questions. That means you’ll probably need a scratch paper to answer the ones based on math principles. In general, the question quality is great, and very similar or even harder than what you can expect to see on your testing day. Typical to flashcards, the questions are on the front and the answers are located on the back. We like flashcards as a supplement to studying, but for some students they be enough to study off of alone. We also find that studying with flashcards makes studying much more convenient and approachable. Answer questions throughout the day and you’ll be reinforcing the material faster than you’d think.